Windows 10 is at the end of the completion on its official version for consumers, which makes it vital for DVD collectors, who wanna rip and copy protected/region-blocked DVD movies on Windows 10, to screen out the best free Windows 10 DVD ripper software. So we hold a thorough review of top 3 free DVD rippers for Windows 10. There will also, doubtless, be guides on where to free get Windows 10 DVD rippers and how to convert DVD movies to MP4, WMV, AVI, MOV, etc or copy DVD video to iPhone, iPad, Apple TV, Android devices, PSP, etc on the new Windows OS. How to Fast Rip DVD Movies on Windows 10? Will Windows 10 Play DVD Movies? "Installing the Windows 10 Technical Preview and Consumer Preview disables the PC's ability to play DVDs using Windows Media Player, regardless whether it is a homemade video or a retail movie DVD. Tried Windows Media Player as well as VLC. No dice." Windows 8, unlike Windows 7 and its other predecessors, has no native support for DVDs. Comparing Windows 10 with Windows 8, surely there are many stunning new features, such as the returning of classic Star Menu, the enrichment of audio/video formats, including FLAC, MKV and HEVC/H.265, which makes 4K video playable on Windows 10, and so on. But, does Windows 10 play DVD? The answer is "No" according to users' test. At this point, a best free Windows 10 DVD ripper is of great importance. 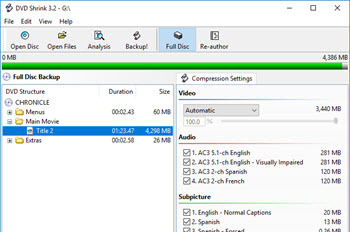 A DVD ripper, coming with various conversion choices (a long list of supported input & output video formats and devices), enabling access to encrypted DVDs, equipped with customization tools (to trim/crop video and adjust video parameters) and featuring ease of use, would be the one we prefer, provided that the DVD ripper is free and compatible with Windows 10. As outlined below, we pick out best 3 free Windows 10 DVD ripping software for you. Output Format/Devices: MP4, MPEG, FLV, MOV, MP3, iPhone, iPad, iPod, Apple TV, Samsung, HTC, PSP, etc. Output excellent image quality at no.1 fastest DVD ripping speed due to support for Hyper-Threading and Super Encode Engine based on MMX- SSE & 3DNow!. Unlock region codes and remove commercial DVD copy protections. Not support Disney protected DVDs >> upgrade to Platinum Version. No digital output formats or devices, like MP4, iPhone, Android, etc (more for DVD burning). No constant update. Find no way to delete the loaded dvd content. Output Devices: iPhone, iPad, iPod, iTunes, Apple TV, Android, Windows Phone, etc. Bypass CSS DVD protection only if libdvdcss.dll/libdvdcss.pkg is installed previously. Hard to figure out how to calculate video parameters, e.g. 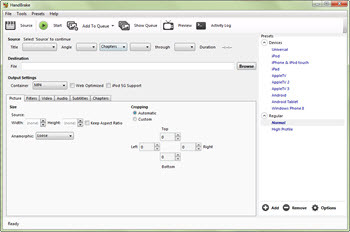 Bitrate, to balance video quality and target size. Cannot rip most protected DVD movies, especially encrypted by Disney X-project DRM. Disney X-project DRM supported. Hardware Acceleration. How to Rip a DVD on Windows 10? All top 3 free DVD rippers for Windows 10 mentioned above cannot deal with Disney protected DVD movies, which contains 99 titles to confuse users. 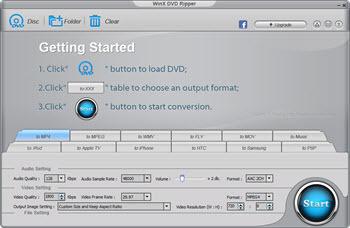 Here we will show you how to select the right title and fast rip DVD, be it copy-protected or region-locked, to iPhone X with an upgraded version of one of the best 3 free DVD rippers for Windows 10. Download WinX DVD Ripper Platinum on Windows 10/8/7 or previous. Step 1: Input a source DVD. Insert your Disney DVD into the drive and click "Disc" button to load the content. This Windows 10 DVD ripper will auto detect the right title among the 99 ones. Step 2: Choose an output format. Go to Output Profile -> choose "to iPhone Video" under the "Apple Device" option -> Select iPhone X (MPEG4 or H264). Step 3: Start ripping the DVD on Windows 10 PC. Make other settings if necessary. If the auto-selected title turns out to be not the right one, please feel free to Mail Us for technical support. Specify an output folder and click "RUN" to start ripping. * Easily rip Disney/Paramount/Warner DVD movies on Windows 10 to AVI, MP4, H.264, MOV, WMV, MPEG, MTS, FLV, iPhone/X/8/7/7/6S, iPad/Air 2/mini 3, Apple TV, iTunes, Android Samsung Galaxy S9, HTC, Chromecast, Sony PSP/PS4, etc (up to 350+ profiles). * Bypass All Copy & Region Protections, including Disney X-project DRM, CSS, RCE, APS, ARccOS, etc. * Unique level-3 hardware acceleration is added now to reach amazingly faster DVD ripping speed than before. You need hardware acceleration for DVD ripping. Why?